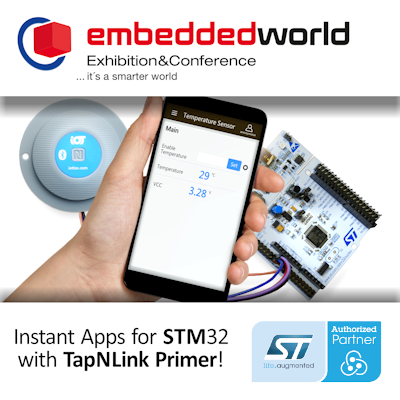 Embedded World '19 - Turn-key connectivity for embedded systems. TapNLink Target Programming app demos wireless programming for firmware update of a wide range of Cortex M-based microcontrollers including the full range of STM32 devices. The app offers all the common memory programming features (blank check, dump, erase, program, verify,...) used in the design phase... but from a mobile phone! Both capabilities come in a simple, easy-to-integrate component that can be added to any microcontroller-based system in just minutes. No hardware design or coding required! TapNPass Nomad and Fixed wireless adapters are in stock now! See how they transform any available fieldbus into a wireless port for local connection of mobile devices (Android, iOS, Windows 10). TapNLink NFC / BLE and NFC / Wi-Fi modules and kits are in stock now! Instantly link your microcontroller applications to mobile devices (Android, iOS, Windows 10). Just plug in, configure and you're connected! TapNLink PRIMER-NB evaluation kit will help you get started in minutes and now supports Arduino!